John Hughes said there were "one or two raised voices but no fisticuffs" in the Hibernian dressing-room after their Co-operative Insurance Cup exit. And the manager praised his players despite the 3-1 third round defeat by Kilmarnock that comes on the back of a poor start to their league campaign. "There were one or two words and I am wanting that," he told BBC Scotland. "In terms of effort, commitment and spirit, it was there in abundance and I can't fault the boys on that." Hibs took an early lead through Jonathan Grounds, but the home side hit back with two Jamie Hamill goals before David Silva soon finished off the contest. 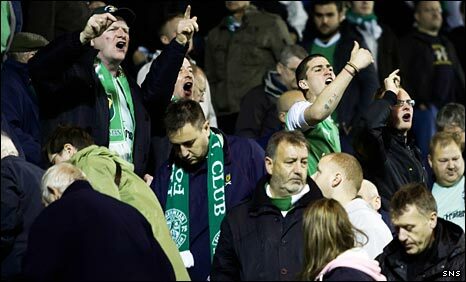 Some of the travelling fans vented their frustration at the former Hibs skipper as their disappointing run continued - the team have won just four matches out of 26. But Hughes said: "I am always honest in the way I see the game and I thought we did enough to win the game. "If you get to 2-0, that would ease the pressure a bit and then you can really get slick. But it was not to be and that's what's happening with us - it is not falling for us and we are not getting that bit of lady luck. "The boys are absolutely gutted. If there was a problem with the spirit, I would be worried, but they are giving their all and there is real disappointment that we got beat. "We are just not carrying any luck and we just need to get that win and, if we do and go on a wee run, the media will jump on to someone else." Hughes praised Kilmarnock for their own spirit and standard of play and added that he "feels for" the supporters who have had to suffer his own side's recent results. However, his message to his own players was: "Keep giving me what you are doing, keep training the way you are, keeping getting that spirit and we'll get that turn and, as soon as it turns, we are off and running."